This cabinet card features a portrait of Massachusetts Senator Josiah Bennett. His mustache is very notable and earns him a spot in the cabinet card gallery category “Mustaches (Only the Best)”. Be sure to check out the collection of extraordinary mustaches. This portrait was taken in 1885 by the Bushby & Macurdy studio located on Washington Street in Boston. Asa Bushby was born in South Danvers, Massachusetts in 1834. He was a self taught portrait painter and after returning from the Civil War, he became a photographer. He opened a studio in Peabody, and then moved to Lynn, and later to Boston, Massachusetts. At some point in his career, he partnered with George W. Macurdy. He is listed in the 1889 Boston business directory. At the end of the 1880’s he moved to Tacoma, Washington and died there in 1897. Civil war buffs may be interested to know that Asa Bushby served in the 1st Regiment Massachusetts Heavy Artillery (company D). He entered, and later left the regiment as a private. To view more photographs by Bushby & Macurdy, click on the category “Photographer: Bushby & Macurdy”. Josiah Bennett served as a state senator. He was served on a committee that addressed state prison issues. Hopefully, further research will yield more information about Mr. Bennett. This cabinet card captures a pretty girl posing by a window in the studio of W. M. Wires, in Lynn, Massachusetts. 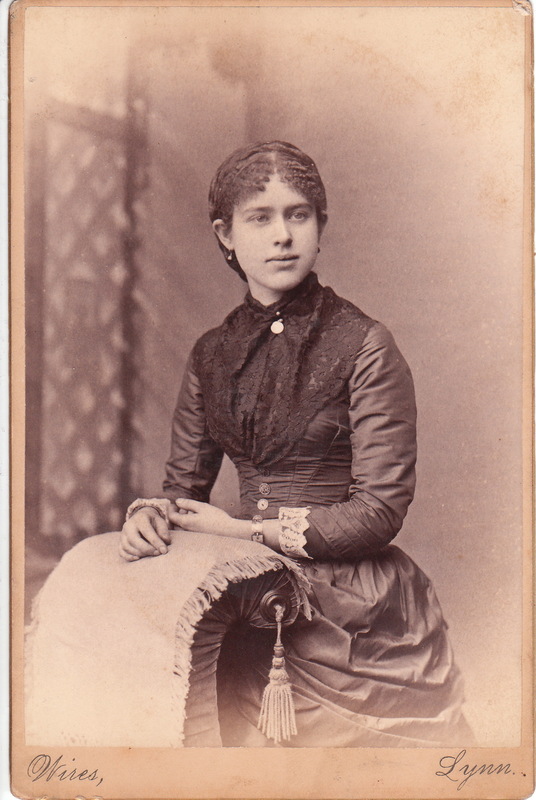 The young woman has relatively short hair for the era, and she is dressed quite fashionably. The photograph was taken in 1882.